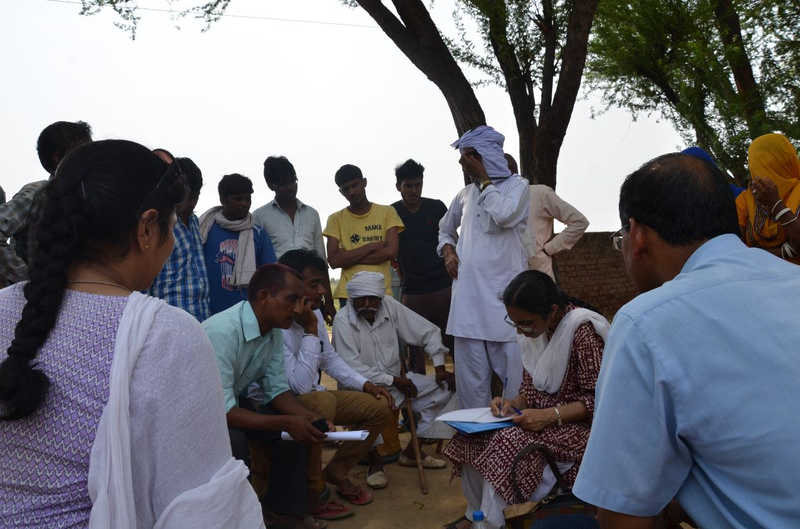 As part of UBA activities, one of the teams of IIT Delhi decided to adopt a village in Farukhnagar block of Gurgaon district (Haryana) so as to help in proper planning of the development activities. Gurgaon district was chosen due to proximity to IIT Delhi. It was decided to approach the district administration for identifying a suitable village in the area. A meeting with the Gurgaon Deputy Commissioner was held in October, 2015. He put IIT Delhi team in touch with the SDM of Farukhnagar. In November, 2015 a meeting of some of the team members was held with the SDM and the BDO of Farukhnagar in Pataudi (both SDM and the BDO also had additional charge of Pataudi block). The prime objective of this meeting was to apprise the officers of the scope of the participation by IIT Delhi in the upliftment of a village/village cluster. Accordingly the BDO was requested to identify a backward village in the block Farukhnagar which is the focus of the work by this IIT Delhi team under UBA. Subsequently, the village Khurampur was identified. No proper roads in the village. Even the main phirani is kuccha and full of slush. No drainage of wastewater (grey water). It flows through the streets resulting in all roads being slushy. No place for putting garbage. No primary health centre in the village. Very few families have a toilet. At the time of this meeting, the village had no panchayat. This village was always a part of a three-village panchayat and had generally been neglected and hence the village was very backward having lack or inadequacy of even basic amenities. Later on a separate panchayat for this village was approved by the Haryana Government, the elections for which were due in January. In February, 2016, Sarpanch was elected for the village. He is in touch with the IIT Delhi team telephonically. The faculty in-charge for the cluster Prof Sangeeta Kohli herself took the charge and lead the team for conducting house-to-house survey. NSS IIT Delhi students helped in the carrying out the survey and analysis of the data for the same. Prior to beginning the survey, all students were trained on the processes and survey forms. Also Students had a clear plan of work and timeline in their mind before going to the village. After the first meeting and survey work it was decided that the IITD team will prepare a plan for the work in this village under UBA and share the same with the BDO/SDM. The plan of work was prepared and sent to the SDM by email and an appointment was sought to discuss the issues of funding. A meeting was organised with the SDM in his office in Pataudi (The SDM looks after both blocks: Pataudi and Farukhnagar). The then BDO had been promoted and was getting relieved around that time. Thus, he could not join the meeting. There were no clear guidelines regarding how the village development work could be taken up under different schemes. The schemes could keep changing and hence this was a dynamic process. The team was told that some funds could be obtained from Haryana Rural Development Fund (HRDF). However as per the information available on website, there is a very wide range of activities (including rural roads) which could be funded from HRDF. SLWM (Solid Liquid Waste Management) is another scheme under which funds are being provided for toilets and wastewater treatment. This scheme seemed to fall under Swachh Bharat Abhiyan. A proposal submitted in 2014 is yet to be funded under SLWM. PWD had made the main approach road to the village. The Public Health Department takes care of the water supply through bore-wells. There is a need to talk to the DC and ADC to find out more about the possible flow of funds for various tasks. After the meeting in Pataudi, the team moved to the office of the Panchayat Officer in Farukhnagar where the IITD team had a detailed talk with the Sarpanch, the SEPO, The Gram Sachiv and the Junior Engineer. It was told that the SEPO is next to the BDO in a given block. The Gram Sachiv looks after the development work in 4-5 villages. There is one Junior Engineer for 8-10 villages and he carries out all the survey work in the village before any development work is taken up. For waste water treatment, once he gets the order from the administration, he carry out the survey for quantity of water being discharged from different areas. This data was used to design the wastewater treatment systems, in the form of 3-pond or 5-pond systems depending upon the extent of cleaning required. It was decided that the next visit to the village will be to carry out further detailing of the tasks to be carried out so as to be able to make cost estimates of the same. It was decided to undertake this visit with special focus on the village roads which need to be constructed. The roads were inspected and pictures were taken. Earlier the Sarpanch was requested to divide each road in the village into one of the three categories: Those with heavy traffic, with medium traffic and with very low traffic. He had done the same and also given the dimensions of each of the roads. This data was collected so that cost estimates for laying out of these roads could be worked out. He identified 14 roads in all indicating what kind of vehicles plied on that road. There are two ponds in village. One is in the northern end where all the village grey water was getting collected. The water in this pond was not even fit for cattle to bathe. There was a bore-well in the middle of the pond which supplied sweet water but at some point of time, the supply pipe of this bore-well had cracked resulting in mixing of the unclean pond water with the bore-well water. After that, this bore-well was abandoned. Much of the settlement in the khurampur village was in the northern end. At the southern end, separated by fields (most of which belonged to Khera village), there was another settlement of about 50 families which was called “Ramji Lal ki Dhani”. This was also part of the Khurampur village panchayat. At this end, there was another pond, which also received grey water from the settlement. However, since the population in that area was small, the water was still able to support fish and hence was fit for cattle to bathe in. There was a bore-well in the middle of this pond as well, which supplied sweet water. Many households collected the drinking water from this bore-well. The main bore-well from which the village got the piped water supply in their homes was further away. We did not see that bore-well. UBA IIT Delhi team contacted the officials of National Rural Roads Development Authority (NRRDA) for possible funding of the construction of roads in this village. They told that every village has to contact their own BDO and state administration for funding of these roads. The team decided to prepare a broad estimate for the cost of construction of these roads. By this time, it was clear that the tasks of having a wastewater treatment unit in the village and construction of roads had to be planned in tandem. So, it was decided to go to the village again with related experts from IIT Delhi with focus on the grey water treatment by inspecting the area and giving their assessment. The Sarpanch had to be away from the village due to some urgent work and we were guided inside the village by the ladies from his family. The team looked at the pond in the northern end more closely, took pictures for the entire periphery. Also the team visited the pond in Ramji lal ki dhani and some streets in the village, some of which were paved and had drains. The grey water treatment unit can be put up near the pond in the northern end. The water in the pond needs to be cleaned. For this, the pond can be temporarily partitioned once the treatment unit is in place with the existing grey water in one part of the pond. This water can be treated and stored in the second part of the pond. Once the entire pond has treated water, the partition can be removed and on a regular basis no untreated water would be allowed to enter the pond. Proper arrangement can be made to ensure that the storm water which should get collected in the pond does not get mixed with grey water. construction work. The mode of getting the survey done is being explored after discussion with the civil engineering faculty and staff. In the meantime a digital map of the area has been obtained from HARSAC, Hissar. However, the map does not have any details of the village settlement area. Laying of roads with the possibility of using waste debris material from Delhi/Gurgaon to reduce the construction cost. Setting up a grey water treatment unit. Revival of the toilet in the Anganwadi and connect it to a biogas plant. This biogas plant can be constructed such that it can also take the kitchen waste/some cattledung from the school and the other surrounding area. 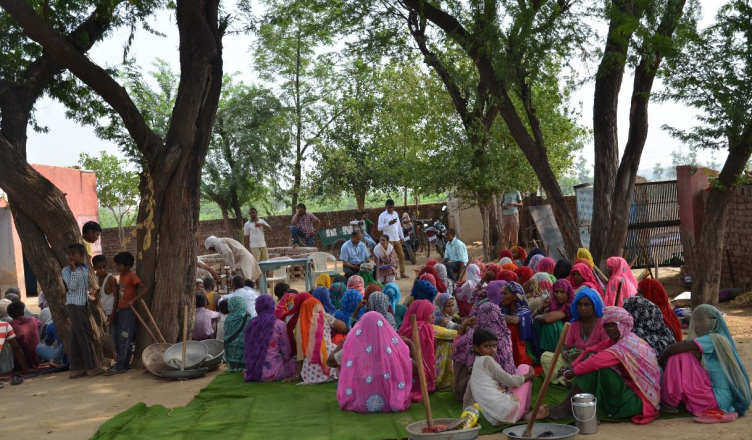 The resultant biogas can be used in the kitchen of the anganwadi. The ADC wants IITD team to prepare a Village Development Plan (VDP) for Khurampur, which should cover the physical infrastructure, effective governance and the social development as laid out in the guidelines for SAGY (Sansad Adarsh Gram Yojana). He promised full support to IITD team for the preparation of the VDP. He will make a sample VDP available for us as a guideline. He instructed his planning officer, to provide a copy of the detailed report for one of the villages to IIT Delhi, which has been prepared by an agency. This will be made available to us in next few days. A good VDP, which would take care of planning for the next 3 years, would take 1-2 months to prepare. He suggested that IITs involvement in Khurampur village should lead to use of technologies which are beyond the conventional, which are more cost effective and less resource intensive and focus on use of local materials. Such technologies, which may not be part of the main-stream can be used in Khurampur on pilot scale. He suggested that after the preparation of the VDP, a joint committee between the administration and IITD be constituted to prioritise the requirements and the use of Government funds over next three years. Thus, the suggestions of the ADC were completely in agreement with the guidelines from the MHRD and MoRD regarding UBA. Also, soon after the meeting with the ADC, a gram sabha was proposed to talk to the villagers about the need for preparing a VDP for which their cooperation is required. The UBA IIT Delhi team was continuously following up with district administration for a meeting with DC. After several follow-ups and impatient waiting finally the team got an appointment from DC office. SDM Pataudi has been appointed as the Nodal Officer from District Administration for all future correspondence and coordination with the IIT Delhi Team. Similarly Professor Sangeeta Kohli would be the Nodal officer from IIT Delhi for all future correspondence. BDPO Farrukh Nagar has been directed to depute a computer literate Gram Sachiv in village Khurrampur with in the next two working days. The implementation team of all projects in the village would consist of SDM Pataudi, BDPO Farrukh Nagar, SDO Panchayati Raj Farrukh Nagar, concerned JE Panchayati RAJ& Gram Sachiv of village Khurrampur. Regarding Solid Liquid Waste Management (SLWD), BDPO Farrukh Nagar has been directed to intimate about the status of sanction of the project at the earliest to SDM Pataudi so that further necessary action could be taken. Regarding Solid Waste Management and Liquid Waste Management project the design suggested by IIT Delhi would be the legally accepted design. The IIT Delhi team has been requested to put up a proposal for SLWM Model. Regarding planning for development of the villages, IIT Delhi team has been requested to examine the already existing Gram Panchayat Development Plan(GPDP) and put up valuable suggestions. Regarding utilization of grants already sanctioned, the IIT Delhi team would examine the estimates sent to the Headquarter for approval and put up suggestions if any. Regarding Skill Development in the village under the NSDC and DDUGKVY and formation of Self Help Groups (SHGs), the IIT Delhi team would come up with suggestions in near future. For funding of loans the Nodal Officer would be Smt. Deepti, DPM, DDURLM. Regarding improvement in Health and Education segment of the village the IIT Delhi team has been requested to sent proposals to the District Administration. development activities in the village. It was felt that without the involvement of district administration nothing can be implemented. IIT Delhi has connected with the NGO Chintan to make a comprehensive proposal for solid waste management in the village. At the bottom-most level of this activity is waste segregation at source which requires appropriate bins for use in each household. IIT Delhi proposes to use this requirement as an opportunity for employment generation for some people in the village. Thus, it is proposed that suitable bins be designed which can use locally available material and which can be made locally by the villagers. We have been told that there are two options for the locally available renewable material suitable for this purpose : Twigs of Shehtoot (Mulberry) and Sarkanda (out of which Moodas are made in that region). A proposal on Solid Waste Management in Khurampur was prepared by the NGO Chintan with some additions by IIT Delhi. The same was forwarded to the District Administration. 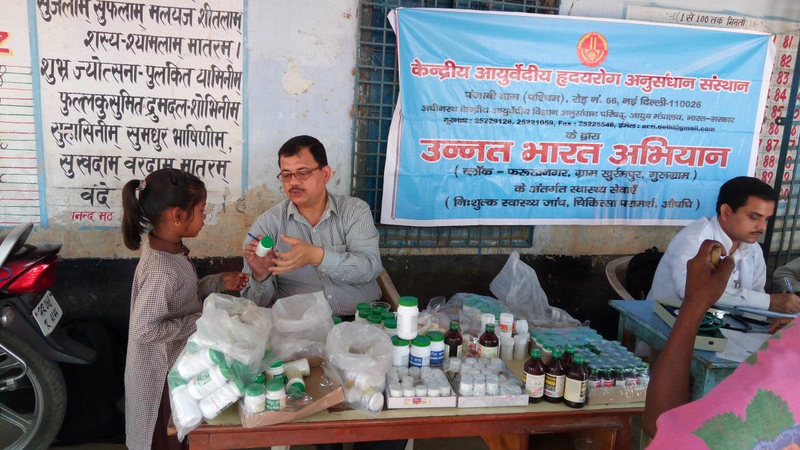 The village Khurampur does not have any primary health centre. Possibility of some ayurvedic/homoeopathic physicians visiting the village periodically through the Ministry of AYUSH was explored. The National Coordinator, UBA provided the contact of the Dy. Advisor, AYUSH. The team met her in AYUSH Bhavan. She directed to the Dy. Secretary. He was very helpful and has agreed to arrange for the visit of an Ayurvedic physician and a Homoeopath on alternate weeks for next few months on a temporary basis. Such visits to Khurampur are being held every fortnight for the last few months. In the village however this is only a short term solution. For long term (Permanent) solution IIT Delhi team is approaching state government through D.C for establishing an AYUSH Clinic in that area. In Khurrampur, there are many potter families but most of them are not doing that work. A few families making pottery have requested for improved kilns with less pollution. For developing an improved pottery kiln, we have requested NBCFDC (National Backward Class Funding and Development Corporation) for funds. Their representative made a visit to the village once but he wanted to talk to all the families of potters community to gauge the future of pottery in the village.